The Blue Ribbon Bacon Festival on Jan. 31, 2015, in Des Moines, Iowa. Despite links to health problems, including a World Health Organization report confirming that processed meats cause colorectal cancer, bacon has been popular enough in the last few years for pork industry workers to start referring to a “bacon tsunami.” The trend is good economic news for Iowa, the top pork-producing state in the U.S.
Smith, who has an interest in food history, said smoking and curing are preservation methods developed out of necessity long ago, but that studies over the years have connected eating preserved meats to an increased cancer risk. He recommends bacon as a “sometimes” food. An October 26 report from the World Health Organization which reviewed scientific literature on the topic confirmed that processed meat causes colorectal cancer and that red meat is probably carcinogenic as well, being associated with colorectal, pancreatic and rectal cancers. Bacon falls under both categories and is also high in sodium and saturated fat, associated with high blood pressure and cholesterol, respectively. Nonetheless, bacon has become something of a celebrity meat in recent years, featured in everything from calendars to lip balm. Throughout most of the 20th century, Brisbee’s view was the dominant one. Bacon was for breakfast, first and foremost – although it did extend into lunch. Pork belly sales traditionally peaked during the summer for BLT and club sandwich season. But during the 1980’s health concerns about bacon started to dominate and prices sank as consumers started to worry about fat, nitrites and links to cancer. “There was a smear campaign against bacon,” Brisbee said. The National Pork Board, headquartered in Clive, started “The Other White Meat” campaign in the 1980’s to promote a healthier side of pork, generally excluding bacon. But things began to change for bacon in the 1990’s when it began making appearances on burgers, a trend supported by both improvements in precooked bacon technology and pork organizations. “Be inspired” is the new slogan of the National Pork Board. In a 2011 marketing shift away from health, it replaced “the other white meat,” which had been in place for about 25 years. 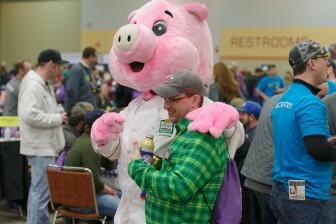 The idea was to focus on encouraging consumers who already enjoyed pork to enjoy it more. According to the National Pork Checkoff Budget, administered by the Pork Board, more than $12 million was spent on pork advertising in 2015. The volume of bacon used in foodservice increased by approximately 15 percent between 2009 and 2015, according to data provided by Patrick Fleming, director of market intelligence and innovation at the National Pork Board. 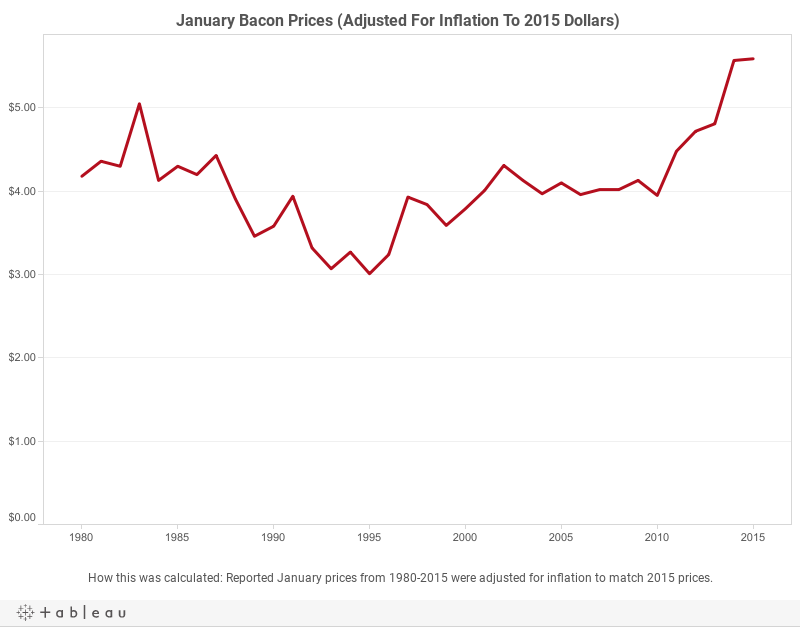 Bacon prices have risen over the last two decades, although an outbreak of porcine epidemic diarrhea virus, or PEDv, contributed to extra steep prices in 2014. Dermot Hayes, an economist at Iowa State University, said price generally is a reliable indicator of bacon’s demand because the supply of bacon is relatively fixed. Hayes also said the United States does not export bacon “because Americans like it so much.” This is in contrast to pig shoulders, ears and tails, which are sent to places like East Asia and Mexico. According to the Iowa Pork Producers Association, some 40,000 Iowans are employed in day-to-day hog production and Iowa’s approximately 20 million hogs account for almost one-third of the market hogs in the United States. The last agricultural census was taken in 2012. Tucked in a back corner of the Old Capitol Mall in Iowa City is Sweets and Treats, a small shop offering an assortment of candies. The shop also sells chocolate-covered bacon. Crème Cupcake in Des Moines also offers bacon-inspired desserts: two kinds of bacon-topped cupcakes. A server there said that although she thinks they’re delicious, she often has to convince customers to try them. Though bacon may not be the hottest seller at Sweets and Treats or Crème, it has fared better at other Iowa establishments. 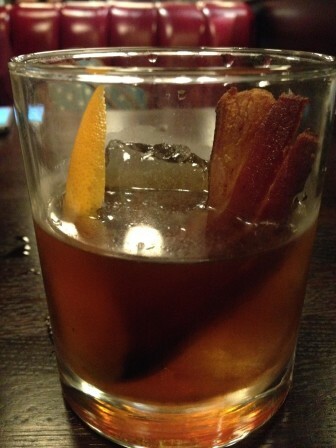 The Tipsy Pig at Pullman Bar and Diner in Iowa City is a cocktail featuring bacon bourbon and a bacon garnish. Tipsy Pig cocktail featuring bacon bourbon, on Dec. 13, 2015 at Pullman Bar & Diner in Iowa City . “It’s like an Old Fashioned for carnivores,” waitress Phoenix Paintin said in December of the drink, which she said has been popular at brunch. At Jethro’s BBQ n’ Bacon Bacon in West Des Moines, customers can order a bucket of bacon, although the restaurant’s most popular sandwich is the traditional BLT. Jethro’s BBQ n’ Bacon Bacon is one of several themed Jethro’s BBQ restaurants. Gerleman said bacon is of higher quality today than even 10 years ago because it is less fatty. Joseph Sebranek, a professor of animal science at Iowa State University specializing in meat science and processing, wrote in an email that pigs have a leaner body composition than several years ago due to selective breeding, not to be confused with genetic breeding. “There is a happy medium for fat content of bellies, which is where most bacon is now,” Sebranek wrote. However, Sebranek does not attribute the recent rise in bacon popularity to any particular changes in the product, but rather to a social phenomenon. As befitting the top pork-producing U.S. state, Iowa celebrates bacon more than most. 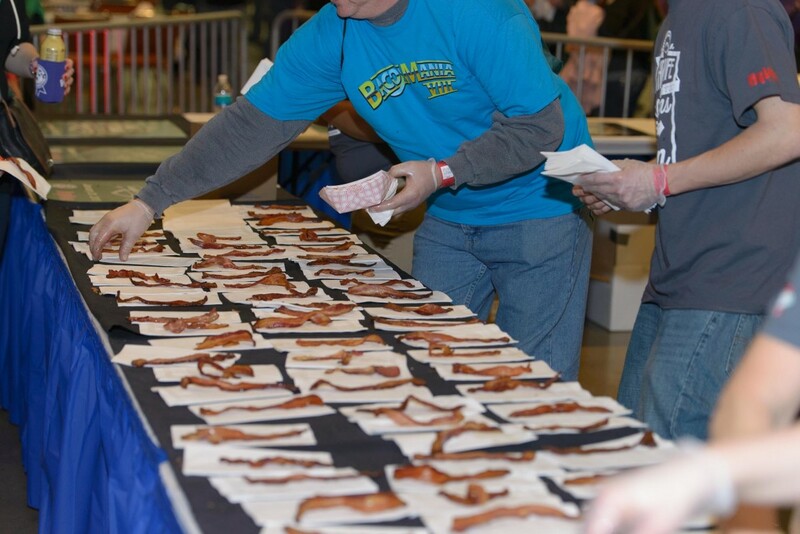 The ninth annual Blue Ribbon Bacon Festival will be held in Des Moines Feb. 20. “A group of guys started celebrating bacon as a kind of getaway in Spirit Lake, Iowa,” Brooks Reynolds, is a commercial insurance executive from Des Moines and one of the event’s founders, said. As he and his friends got older, they found it harder to schedule a weekend to take the trip and eventually decided to host a bacon festival in Des Moines, instead. “We try to create a fun, wacky, different event,” Reynolds said. The festival has grown from fewer than 200 participants in 2008 to over 15,000 in 2015. The founders have also begun hosting similar bacon events in other states and even in Reykjavik, Iceland. The Reykjavik festival started after an Icelandic acquaintance felt the country could also use a bacon celebration. Allison Schafer, a University of Iowa junior studying journalism from Panora, Iowa, said she hopes to become this year’s Bacon Queen at the festival. She has been following the event since she was a teenager and is excited that this year she is 21, old enough to enter. Schafer said an example of a question that contestants in a previous year were asked is whether or not they’d rather eat bacon-wrapped penguin or bacon-wrapped whale – whale being the preferred answer because it would involve more bacon. Sandra Ukerman, a German student at the University of Iowa pursuing a master’s degree in American studies, said she remembers seeing a picture on the internet of a cocktail topped with half a donut and a strip of bacon. In an effort to promote incorporating bacon into a healthy lifestyle, the theme of this year’s bacon festival is 80’s style aerobic fitness. This story was produced by the Iowa Center for Public Affairs Journalism-IowaWatch.org, a non-profit, online news Website that collaborates with Iowa news organizations to produce explanatory and investigative reporting.